What is the perfect antidote to a night of dancing and excess? A greasy diner breakfast, of course. We really enjoyed Quaker Diner last time, but I love trying new places so we went to Mo’s Midtown, a hole in the wall breakfast joint in the West End neighborhood. There was a short line when we arrived, but 10 minutes later, we were able to snag 2 counter seats. We both got the Papa Mo - 2 eggs, hash browns, choice of breakfast meat, and toast ($5) and I ordered a blueberry pancake ($2.65), as well. I opted for sausage and my plate was decent, but nothing special. 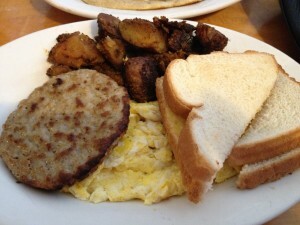 The hash browns had a nice dark crispy crust with a peppery kick, but my eggs were over cooked. 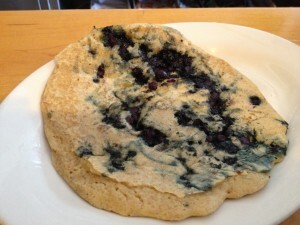 The pancake looked appalling, misshapen and pale; it tasted like Bisquick. Christine agreed that Quaker diner was a superior option.